WD-40 The most versatile product for de-watering, lubricating, stopping squeaks, freeing rusted components, etc. etc. Used by many fibrous plaster shops for a release agent on fibreglass moulds. 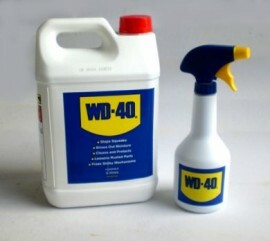 Large (5 litre) Value Pack complete with re-fillable spray applicator bottle.